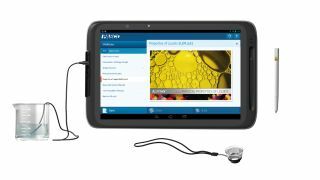 Intel has never shied away from supporting education, and now the company has used the BETT education expo in London to unveil its latest pair of ruggedized tablets designed for younger students. First up, the Classmate PC is a 10.1-inch Windows 8.1 tablet that's been fitted with rubberised corners to make sure it survives being slung about by rowdy youngsters (ed: well almost). According to Intel, its rugged design allows it to withstand falls of up to 70cm and the product is both dust and water resistant. It's all in the name of protecting what lies under the hood, which takes the form of a Bay Trail-based dual-core Celeron N2806 CPU clocked at 1.6GHz. The Classmate also offers the option for a touchscreen display for the first time alongside a fully rotatable webcam. On the lookout for other potential markets, Intel is gearing up to release the device in Windows 7 and Linux variations later this year. More rubber = more fun? Joining the Classmate is the 10-inch Education Tablet, which runs on Android 4.2. Cladded entirely in rubber for easier handling, its other child-friendly features include a power button that apparently ignores accidental presses and comes with a pen-like stylus. Powered by a dual-core Intel Atom Z2520 at 1.2GHz with hyper-threading technology, it gets a 3D visual boost from Intel's Graphics Media Accelerator engine that supports 1080p video output. It also features front and rear cameras, optional 3G support and an average 12-hour battery life, according to Intel. Both models, which are geared toward science lessons through the inclusion of snap-on magnification tools and a temperature sensor, are slated for release later this month.